The Clean Streak crew has exceeded our expectations by going above and beyond. Their integrity, professionalism, and commitment to customer satisfaction are unparalleled. They always made time to accommodate our last minute cleaning request and consistently did a thorough job. The owner, Horace Adell, even came to our business and personally invited us to a customer appreciation barbecue. In the age of impersonal service, this community building gesture meant so much to us. We gladly recommend their services to anyone! Clean Streak Inc. is owned and operated by Horace L. Adell, Jr. From the first time you meet Mr. Adell, you know that customer service is his passion. It’s this passion that has helped Clean Streak Inc. to constantly and consistently exceed their customer’s expectations. Mr. Adell has recognized that every aspect of his business has an impact on customer service, not just those aspects that involve face-to-face customer contact. This vision of outstanding customer service even affects the cleaning products he selects for his business. For example, Mr. Adell was choosing environmentally green products before the “green movement” began. Using products that are safe for consumers and the environment illustrates Clean Streak Inc.’s drive to go above and beyond customers’ expectations. 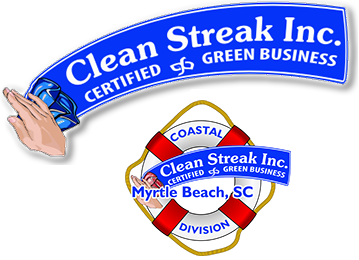 Clean Streak Inc. is the only janitorial service in western NC to have the honor of being Green Certified. As a property manager for Carolina First Bank I am responsible for janitorial services for all bank facilities across the Western North Carolina area. Clean Streak has been providing these services for us for 7 years with excellent results. Horace takes ownership in the condition of each one of our properties and trains his staff personally to clean each branch thoroughly. If ever an issue arises, Horace addresses it quickly and makes sure it gets remedied to the customer’s satisfaction. It’ is nice to have Clean Streak as part of the Real Estate team helping us to provide a clean professional facility for our employees and customers to do business in. I am always confident that if I send Horace out to meet with a branch manager to address a concern, he will leave handle the situation in a delicate and professional manner. Clean Streak, Inc. has worked on many projects for me moving and cleaning my properties including water damage at my Home. I have been extremely pleased. I could not be more pleased by the quality of service I have received from this company. They are thorough and always go above and beyond my expectations. They are a company of integrity and honesty. I also love that they only use green products that will not harm us or our environment. I would highly recommend them! My husband and I are very satisfied customers and have been for over 15 years. Clean Service always keeps our businesses office settings prestine, and are willing to accommodate special requests. I am glad I have a company I can trust and will do the same quality work each cleaning.